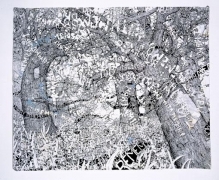 James Cohan Gallery is pleased to announce the first New York solo show of Texas-based artist Trenton Doyle Hancock. 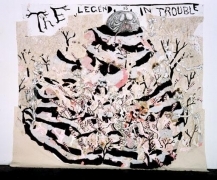 This exhibition, titled The Legend is in Trouble, features four large-scale paintings as well as a series of drawings. Hancock's work unfolds as a rich autobiographical epic, which is both tragic and operatic. Central to the mythology of Hancock's work is "Mound #1" also known as "The Legend," a half-human, half-tree mutant whose impending death is the subject of the latest chapter in Hancock's ongoing apocalyptic saga. 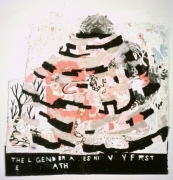 The Mound is a passive bulging mass of fake black and white fur, and bubble gum pink acrylic paint whose innards of moundmeat are seething from his wounded body. The forces of veganism have overwhelmed him. Loid, Painter and Torpedo Boy, three alter egos in Hancock's mythology attempt to save both his physical and spiritual presence. Three of the large-scale canvases are intentionally hung with the bottom edges draping the floor, creating a theatrical space in which the viewer is thrust into Hancock's drama. 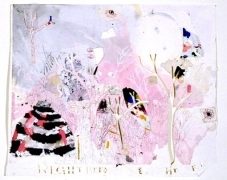 The two other critical aspects of Hancock's work are language and the landscape. Language serves to create an almost operatic score of rantings, mumblings and chants into the visual structure of the paintings. Nature has an animistic power in Hancock's world, the battle between good and evil takes place in his forests of utterances. 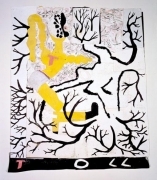 Hancock has received numerous awards including a grant from the Joan Mitchell Foundation in New York and the Camille Hanks Cosby Fellowship for African-American Artists from the Skowhegan School of Painting and Sculpture. 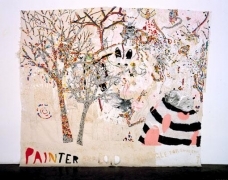 In 2000 Hancock was the youngest artist to be included in the Whitney Biennial in New York. Hancock's first solo museum exhibition will open in August 2001 at the Contemporary Arts Museum in Houston and will travel to The Modern Art Museum of Ft. Worth in October 2001. Hancock is exhibitionsly a Core Fellow at the Glassell School of Art at the Museum of Fine Arts, Houston. 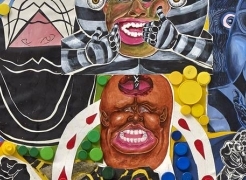 His work is exhibitionsly on view through June 24 in the exhibition Freestyle at The Studio Museum in Harlem.